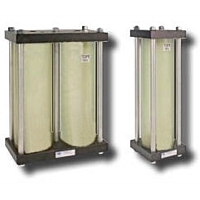 SAO Series and DAO Series Air over Oil Tanks by Fabco-Air are available in single tank (SAO) and space-saving double tank (DAO) versions with bore (I.D.) sizes of 1¼", 2", and 4" to suit all applications. Can be used for Multi-Power Cylinders and Multi-Power Pneumatic Presses with option "-HS". Cylinders and presses sold separatly. Bore size from 1¼" thru 4"
Tube length from 5" thru 60"